“Addressing the 100 Million Youth Challenge, Perspectives on Youth Employment in the Arab World in 2012” is a collection of essays by members of the World Economic Forum Global Agenda Council on the Arab World. The report is published to provide a direct response to the Arab world’s uniquely high level of youth unemployment in order to help sustain the early economic gains in terms of political stability and economic promise that have followed in the wake of the Arab Spring. These cover the following topics: social innovation and new approaches to the employment challenge, determinants and challenges of the current youth unemployment situation, female economic empowerment, building Arab civil society to promote economic growth, access to credit, the economic agendas of Arab Islamist parties, education for employment, and a paradigm shift in government – from creating jobs to enabling job creation. 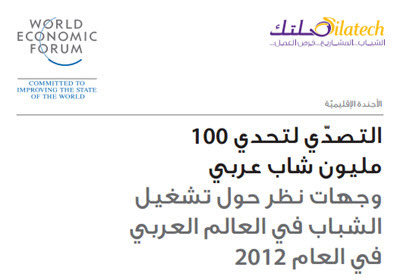 Originally compiled in English by the World Economic Forum, this Arabic version has been produced by Silatech.